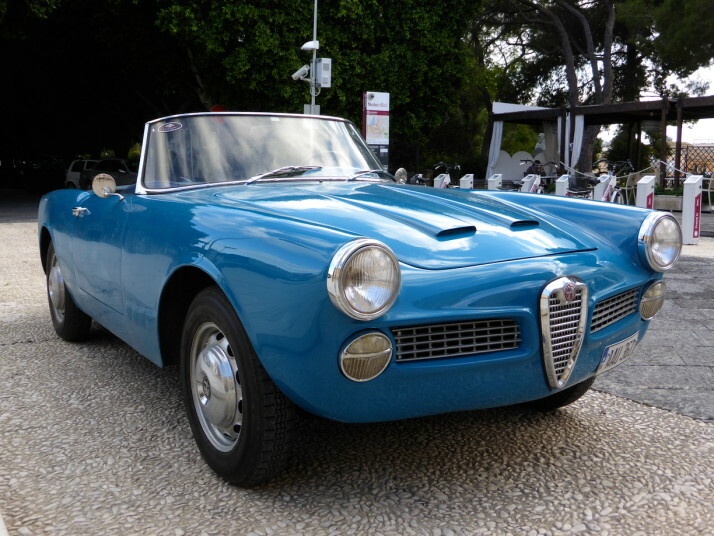 When we planning where to visit in Sicily, it was easy to start in Catania for logistical reasons as we were arriving by ferry from Malta, and while we had lined up some interesting things to do in Catania, it’d be fair to say we were looking forward to our time in Siracusa more. 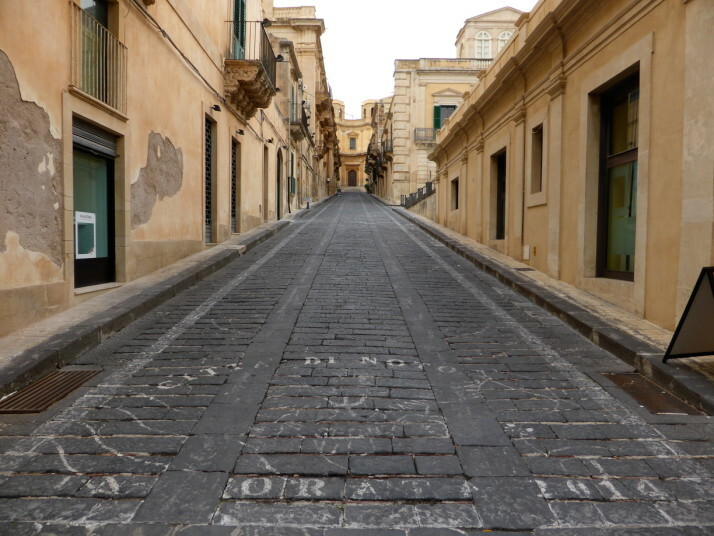 Known as ‘Siracusa’ rather than Syracuse to the Sicilians, the city is over 2,700 years old and has a long and important history. Once equalling the size of Athens, it was described by Cicero as “the greatest Greek city and the most beautiful of them all” in the fifth century BC, and is now inscribed in the UNESCO World Heritage List. However, for us the reality turned out to be the opposite of our expectations. 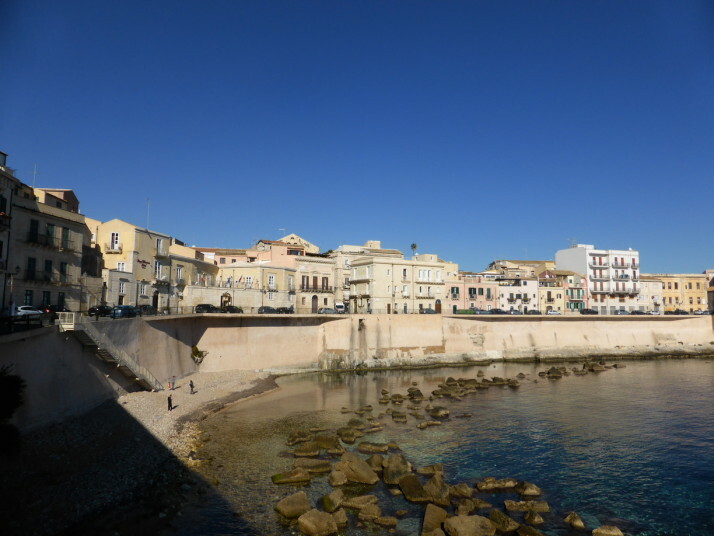 That’s probably in part due to those same expectations being higher for Siracusa than Catania, having had such a great time in Catania, and finding Siracusa to be almost wound-down for winter – this is definitely more of a summer holiday destination. 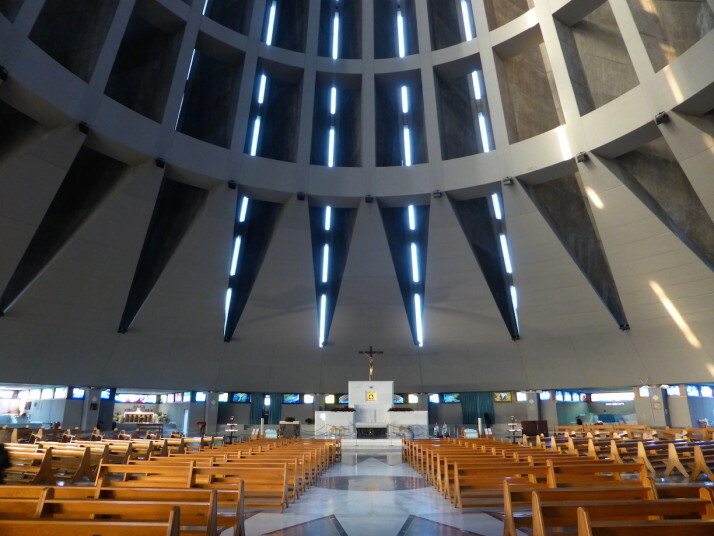 Don’t get me wrong – we enjoyed our time here, and the setting is certainly more picturesque, but we found more to do and see of the kinds of things we enjoy in Catania. 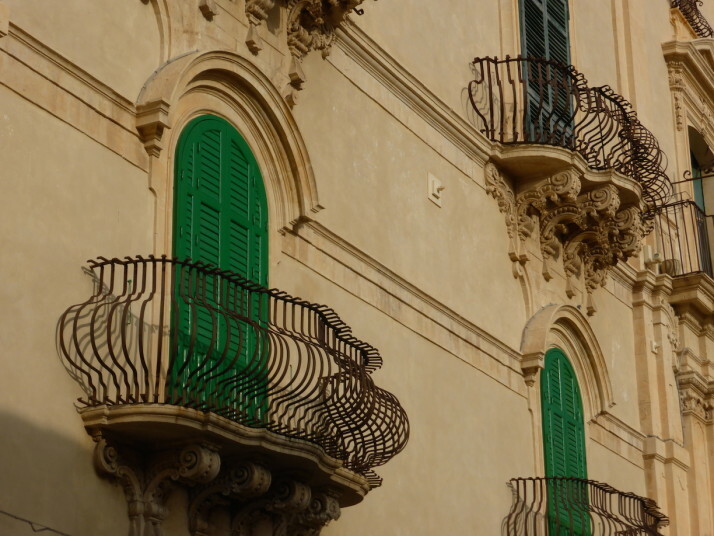 On our first afternoon we headed straight for Ortigia, the island offshoot of Siracusa surrounded by turquoise Mediterranean to get lost in its narrow twisty cobbled streets. 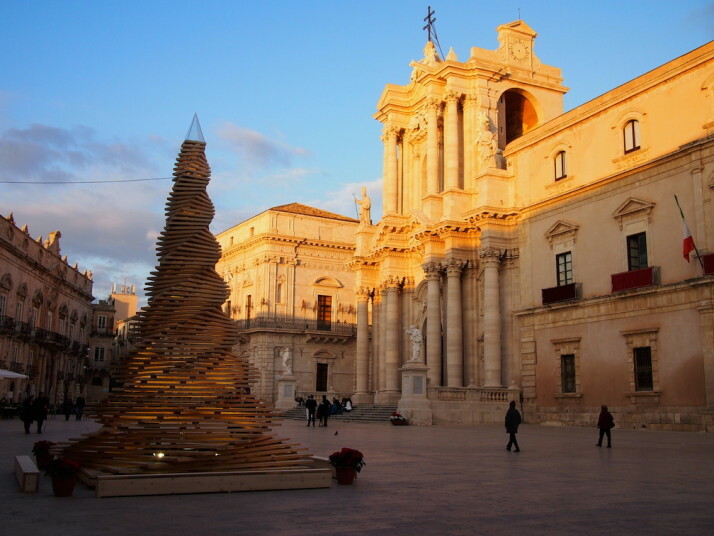 In December, Ortigia has a laid-back touristy feel to it, there are souvenir shops here as you would expect, but “tacky” doesn’t exist in the Italian vocabulary – each of the displays are chic, cute, and tasteful. Taking random turns down little alleyways we eventually found ourselves in Piazza Duomo, the central Cathedral Plaza. Venturing inside, we found thick, imposing vaulted walls enclosing the nave, with huge outer columns – reminders of when this used to be a Greek temple of Athena. It was dark and almost empty, the early evening light shining through the row of stained glass windows creating indistinct patterns of colour on the plain stone. 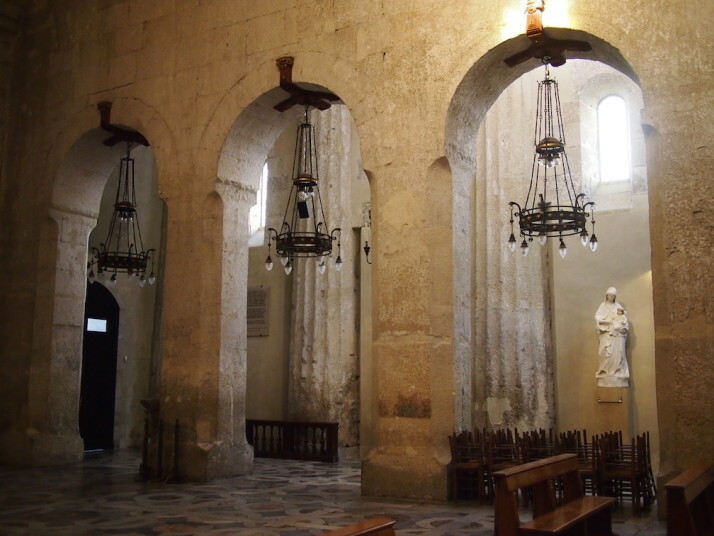 To the right of the entrance was Santa Lucia’s Chapel, the normal resting place of Saint Lucy’s remains. Saint Lucy was a young Christian martyr who died during the Diocletianic Persecution in 304. The following evening we’d been advised in Italian by our apartment owner that there’d be some sort of event featuring Santa Lucia that would travel right past our apartment. At about 4:20pm we headed out to Corso Umberto I and staked out a spot on one of the park benches. Having sat for maybe 30 minutes we thought it was a little odd that the traffic was still flowing down the street despite a couple of very nicely dressed officials standing on every corner. 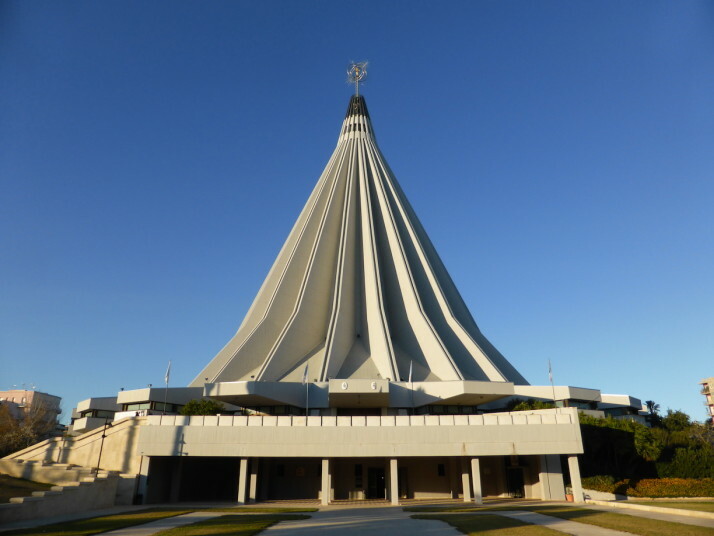 Another 10 minutes or so later I went over and, gesturing down the street, asked about Santa Lucia.. The traffic policewoman nodded and said “twenty o’clock.” With that, we decided to head home and come back after dinner! 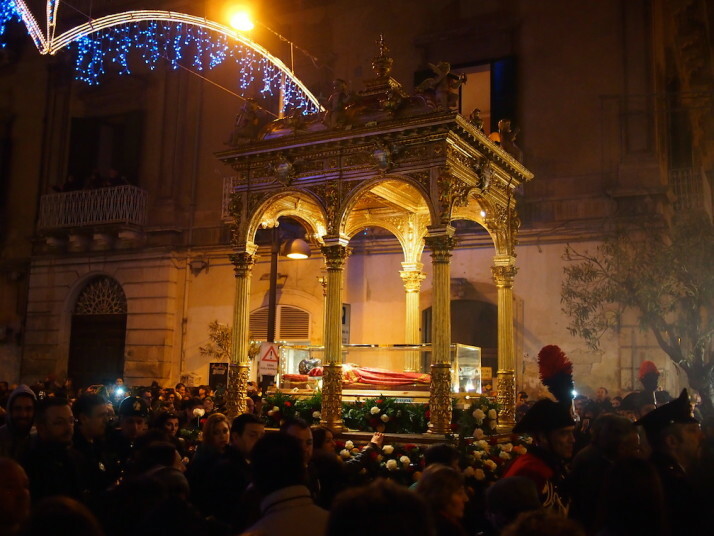 3 hours later we returned to find a full street procession heading for Ortigia. 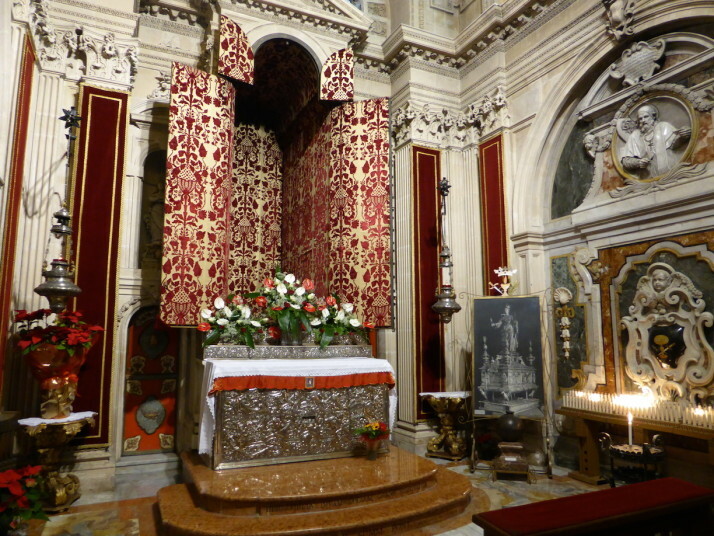 Twice a year the relics of Santa Lucia or Saint Lucy, the patron saint of Siracusa who was born here, are paraded through the streets between the Basilica de Santa Lucia and the Siracusa Cathedral. We were surprised how many people made the walk barefoot and carrying candles! 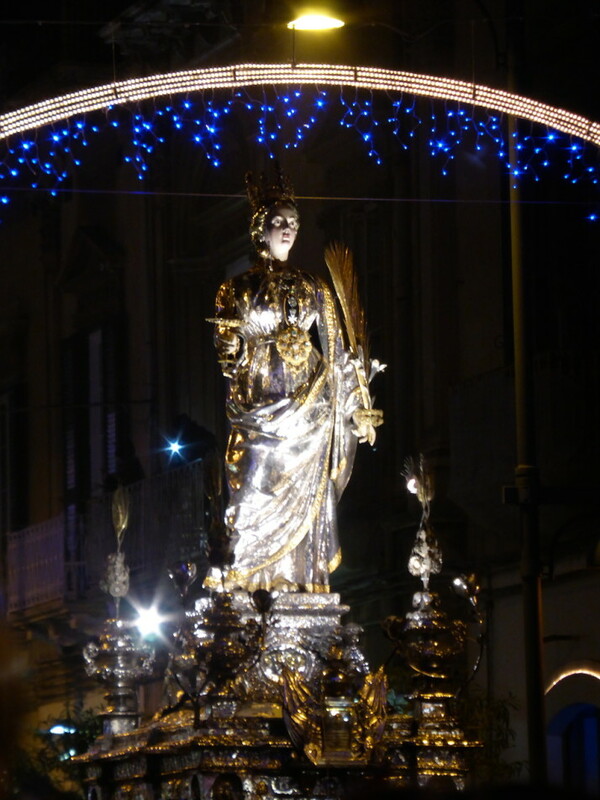 At exactly twenty o’clock, the relics and life-size silver statue passed us! 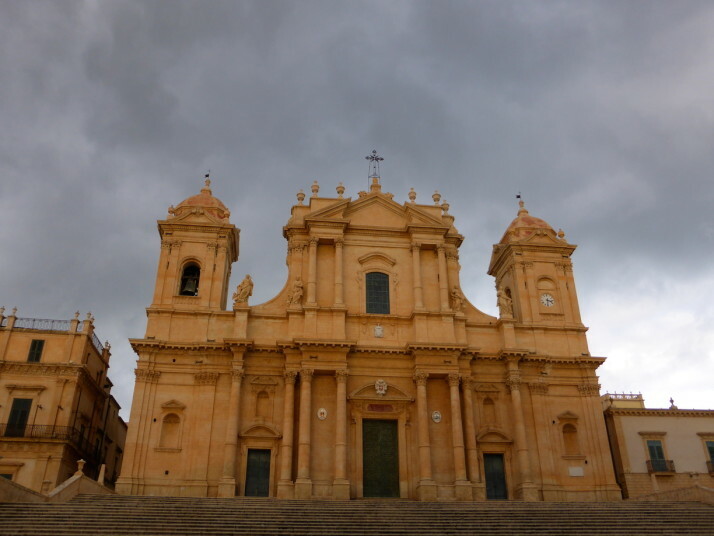 We also took a local train 30 minutes south of Siracusa to Noto, a small town that was devastated by an earthquake in 1693, and was subsequently rebuilt in the baroque style of the day. 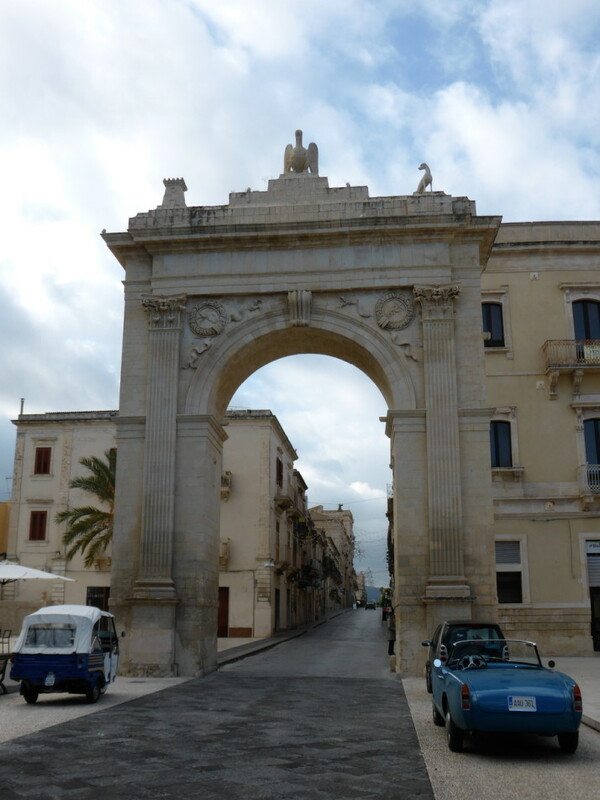 Much of the original Baroque period centre exists today and it too is a UNESCO World Heritage Site. This is Via Nicolaci, the site of an annual festival where the centre of the street is covered in beautiful flowers! It was a little bit of an uphill trek from the train station through the outskirts to reach the main Corso Vittorio Emanuele, but the reward of intricate and exaggerated buildings one after another was easily worth it. We’d read the town looks best in the warm early evening light, and we just got a glimpse of it before the dark clouds came in. 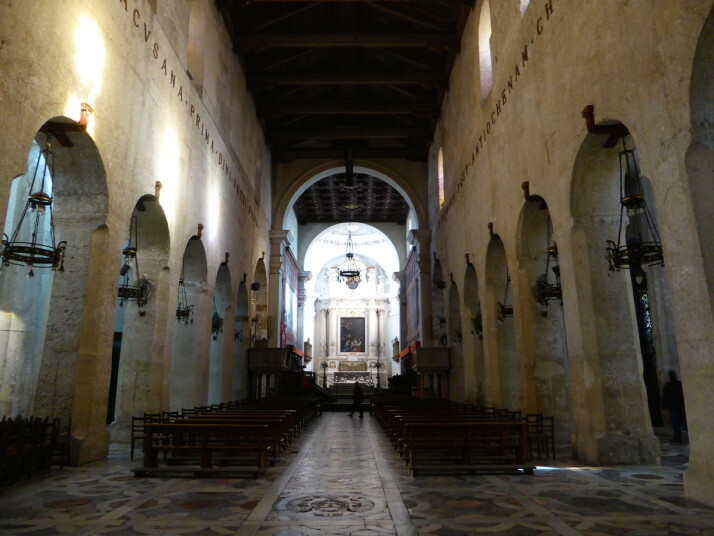 This entry was posted in Places and tagged Architecture, Church, Italy, Sicily, Siracusa on January 2, 2015 by Andrew. Great photo i would love to see photo with every day people to get a better atmosphere , sometime natural photo do wonders as i see the place now on these photo it seems a museum people make the city just like a House becomes a home with people.